Only the second auxiliary bishop named to the Worcester diocese, Bishop George E. Rueger died in Worcester on April 6, 2019. Esteemed by priests and loved by people, he had been auxiliary bishop between 1987 and 2004, serving as auxiliary to Bishop Timothy Harrington; Bishop Daniel Reilly, and Bishop Robert McManus. Born in Framingham on Sept. 3, 1929, he was son of the late Edward and Mary (Reddy) Rueger. He was raised in Worcester, attending St. Peter High School there; then for a year at the College of the Holy Cross, and entered the seminary first at Cardinal O'Connell at Jamaica Plain and finally at St. John, Brighton. Worcester's first bishop and Boston native, John J. Wright ordained him to the priesthood at St. Paul Cathedral in Worcester on Jan. 6, 1958. 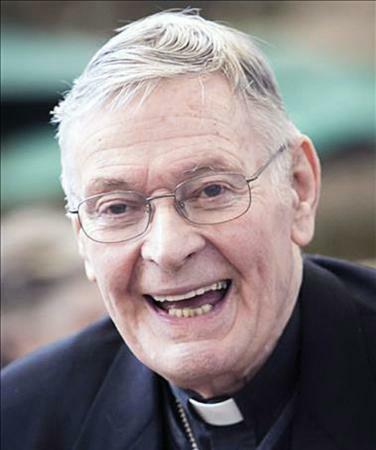 He served in various parishes of the Worcester Diocese over the few decades. He was an avid proponent of Catholic schools, serving as headmaster at Marian High, Worcester, and then later as Superintendent of Schools for the Worcester Diocese. In 1981, he was named pastor of St. Peter Parish, Worcester. Pope St. John Paul II named him titular bishop of Maronana and auxiliary bishop of Worcester on Jan 16, 1987, and Worcester's third Bishop Timothy ordained him to the episcopate at St. Paul Cathedral on Feb. 25, 1987. In subsequent years, he served in varied diocesan offices, including vicar general and moderator of the curia. When he reached the mandatory retirement age of 75 in 2004, he submitted his resignation to the Holy See and Pope St. John Paul II accepted the request. Since his retirement 15 years ago, he has been assisting Bishop McManus, especially in the celebration of confirmation. The Worcester Diocese estimates that in his years as a bishop he confirmed more than 20,000 of the young Catholics of the central Massachusetts diocese. Bishop Rueger's funeral Mass will be celebrated at St. Paul Cathedral on April 13, 2019. Following the Mass he was to be buried in St. John Cemetery, Clinton.